Taking screenshot on a mobile is very use full, some times there may be an information on web, which you might like to take a snap of or an image you like to save but was not allowed to save to your mobile. If you had ever come across this situation, there is an simple procedure to save the image or an web information. Now a days all mobile operating systems are allowing users to take screenshot of the display, in this post I will explain you how to screen capture on iPhone or on iPad. Taking screenshot on iPhone is very simple task, in this task you will simultaneously use two button available on the iOS device. One is the wake/sleep button another the centre home button. 1) open desired webpage or picture on your iOS device. 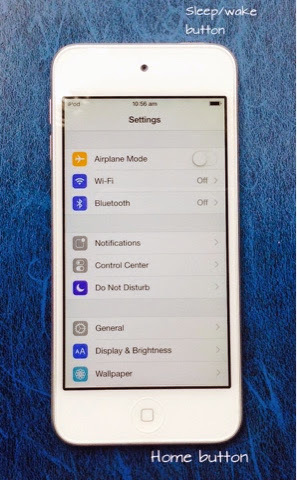 2) now, press and hold the wake/sleep button and also the centre home button at the same time. 3) release any one of the button or both the buttons, according to your comfort, you will notice the screen being captured. 4) The Screencaptured image will be saved onto your Camera Roll.